Thank you all for your amazing comments on my last post. It was so fun reading through them all and I’m happy to know that so many of you love supporting your local farmers market. I hope that the “dish up a veggie” section on the blog can help out a bit for some of those more intimidating items you’re not quite sure what to do with. I’m still working on expanding that list but check it out if you haven’t yet! In the meantime, I’m happy to send a copy of the book to Naomi who is intimidated with mustard greens. I’m hoping that some of my cookbook recipes for mustard greens will help her out a bit! Congrats Naomi! I hope you enjoy the book. So let’s get back to this recipe shall we? The zucchini at the farm is going off and with an abundance of leeks and squash blossoms flooding the fields I thought this would be a great recipe to share. I refer to this as “pizza” because I love to load it up with a bunch of different toppings, but socca– made from chickpea flour– is really more like a pancake or thick crepe. It’s a traditional southern France street food and is absolutely delicious. With a slight nutty flavor and chewy texture it’s the perfect vehicle to load up with your favorite seasonal veggies. It’s a breeze to prepare and tastes great with a simple side salad for a complete meal. I hope you all enjoy this “pizza” recipe as much as we do. Cheers to the summertime harvest! To make the batter, whisk together the chickpea flour, water, oil, garlic and salt in a large bowl. Let the mixture stand for 20 minutes at room temperature to thicken up a bit. Preheat the broiler and place a rack in the upper third of the oven. In a 10 inch cast iron skillet heat the butter over medium-high heat. Add the leeks and cook, stirring often, for about 2 minutes. Add the zucchini, salt, pepper and crushed red pepper flakes. Continue to cook, stirring occasionally, until the veggies brown up a bit and become tender. Remove from the heat, add the veggies to a bowl and wipe out the pan. Place the skillet in the preheated oven for about 5 minutes to heat up. Once the skillet is hot use oven mitts to remove the pan from the oven. Add some olive oil to the pan and swirl it around to coat the bottom. Pour the batter into the pan and return the oven. Cook for about 8 minutes, or until the crust is set and the edges are beginning to brown. Remove the socca from the oven and reduce the heat to 425F. Drizzle the top of the crust with a little olive oil and then spread the veggie mixture over the top and add dollops of the ricotta cheese all over. 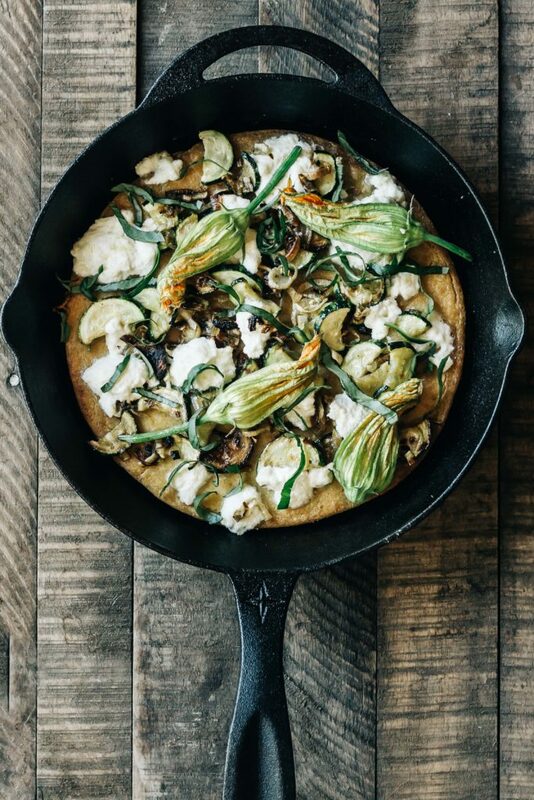 Arrange the squash blossoms around the pizza and add half of the chopped basil. Drizzle with a bit more olive oil and place back in the oven for about 10 minutes. Sprinkle the remainder of the basil over the pizza and let it rest in the pan for about 5 minutes before slicing and serving. This pizza sounds wonderful. I’m pretty sure I won’t be finding squash blossoms (and am not sure about starting to eat things like that in my old age). I’m looking forward to trying this. How thick is the socca crust and does it puff up during cooking? Thank you!! Looks delicious! Do you have a substitute for chickpea flour? I livevin Thailand, so that’s not something I can buy here, but will definitely put it on my list for when I go home to America at Christmas! If you could share an alternative idea, I’d appreciate it. Thanks! This is delicious, definitely a new favorite!